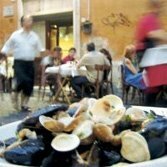 A real neighborhood trattoria in one of Rome’s most up and coming neighborhoods, San Lorenzo. You can smell the fresh fish a block away. Franco and his Irish wife Laura always find the time to chat with you as they manage this bustling place. Serves a wide variety of fish — fried, baked, grilled — at absurdly low prices Creative first courses, including shellfish and beans! Lots of students, locals, and diners in the know. You can make a meal for under €20.